Upcoming Poetry Flash Readings – Petaluma Poetry Walk — Now in Its 24th Year! Cassandra Dallett’s latest book of poems is Wet Reckless. Al Young says,”In poem upon poem, Cassandra Dallett pours out her cool and steaming heart in unmeasured rounds of bittersweet toasts and takes. Dallett’s voice and vision shine.” Among her previous collections are Bad Sandy, Pearl Tongue, and On Sunday, A Finch, which was nominated for a California Book Award. A two-time Pushcart nominee and Literary Death Match winner, she lives in Oakland and writes poetry and memoir about a counterculture childhood in Vermont and her ongoing adolescence in the San Francisco Bay Area. Bruce Isaacson’s new book of poems is The Last Lie: Selected Poems 2009-2017. Jack Hirschman says, “Bruce Isaacson’s wondrously accurate portrait of poet Joie Cook alone would star in this book, but there’s a whole galaxy of brilliant poems that constellate this recent selected poems, so just look up and read them; the pleasure will be all yours.” Recent collections include Tango, Frayed, and Lost Among the Neon. He’s the outgoing poet laureate of Clark County, Nevada, which includes Las Vegas where he lives, and he’s the editor and publisher of Zeitgeist Press. Poet, editor, and professor Melba Joyce Boyd’s book, Wrestling with the Muse: Dudley Randall and the Broadside Press, is a tribute to Dudley Randall (1914-2000) with whom she worked as an editor at Broadside Press and whose authorized biographer she became. Randall was poet laureate of Detroit, a civil rights activist, and a force in the Black Arts Movement. Two of his poems, one for the four little girls killed in the Alabama church bombing in Birmingham, one for the assassination of President Kennedy, were set to music by folk singer Jerry Moore in 1965. Randall published them as broadsides, so the press, publishing chapbooks that opened out the work of African American writers into the canon of American literature, was born. Boyd’s book, connecting politics and art with the wider struggles of black America in that era, is also a dialogue between poets and includes extensive interviews. She, herself, has published six books of poetry, edited an anthology of Detroit poetry, written scholarly books, and produced and directed a documentary film on Randall and the press. M.L. Liebler is a celebrated poet, literary arts activist, and professor. Most recent of his many books of poetry is I Want to Be Once; others include The Moon a Box and Written in Rain: New and Selected Poems, 1985-2000. He’s edited many books, ranging across labor politics, music, and poetry, and his brand new one is Heaven Was Detroit: From Jazz to Hip-Hop and Beyond, with a wide range of contributors, including Greil Marcus and Al Young. Brian Jabas Smith’s debut book of fiction is Spent Saints & Other Stories. Jim Daniels says, “In these fine stories, Brian Smith’s direct, natural, story-telling voice rocks with the authority and grit of someone who’s been there and come back to tell the tale.” Smith is an award-winning journalist, first as a staff writer and columnist for the Phoenix New Times and then as an editor for the Detroit Metro Times. His earlier career was as a songwriter who fronted rock’n’roll bands. He’s written for many performers, including Alice Cooper. A reading and Bay Area celebration for Heaven Was Detroit: From Jazz to Hip-hop and Beyond, an anthology of writing on Detroit’s seminal music and its culture, with editor M.L. Liebler and contributors Greil Marcus, Al Young, Melba Joyce Boyd, Brian Jabas Smith, George Moseman, Joel Martin, and Pat Thomas. Greil Marcus, author of Mystery Train, Lipstick Traces, and most recently, A History of Rock’n’Roll in Ten Songs. Al Young, former California Poet Laureate, author of poetry, novels, and memoirs. His most recent poetry collection is Something About the Blues; some forthcoming books are 22 Moon Poems, October Variations, and Love Offline. M.L. 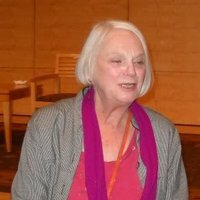 Liebler, poet, literary arts activist, and professor, founder, among much else, of the National Writer’s Voice Project in Detroit, author of many books of poetry, including the forthcoming I Want to Be Once, and editor of anthologies including Working Words: Punching the Clock & Kicking Out the Jams and Heaven Was Detroit. Melba Joyce Boyd, professor, author of nine books of poetry and a number of books, including Wrestling with the Muse: Dudley Randall and the Broadside Press. Brian Jabas Smith, award-winning journalist, first as a staff writer and columnist for the Phoenix New Times, and then as an editor at the Detroit Metro Times, former songwriter and front man for rock’n’roll bands, and author of the short story collection Spent Saints. George “Moseley the Punk” Moseman, member of the “outside-the-box” band the Früt. Joel Martin, well-known Detroit producer, publisher of Eminem’s music and producer of The Romantics, Sponge, Sean Forbes, and others. Pat Thomas, author of Listen, Whitey! : The Sights and Sounds of Black Power, 1965-1975 and the forthcoming Did It! : From Yippie to Yuppie, Jerry Rubin: An American Revolutionary and A&R consultant to various record labels as well as producer of reissues of vintage music by Sly Stone, Carole King, and others. Copyright © 2017 Poetry Flash, All rights reserved.